I’ve had the opportunity to visit a few really great art stores all across the world. 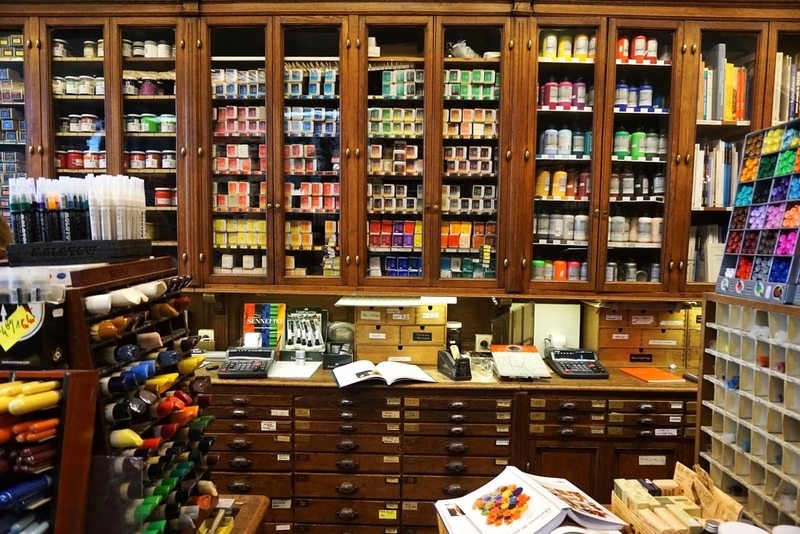 In these art stores, you’ll get lost in the depths of the aisles of handmade paints, palettes and every other obscure art-making material known to man. My favorite art shop that I’ve visited is Sennelier in Paris. Artists like Monet and Van Gogh have walked through its Seine-facing doors. Austin and I ducked into the store on a rainy day when we were there last year, and my mind still wanders through the memory of the tall shelves full of potential. I picked up some of paintbrushes and a small watercolor palette because that was truly all my budget and my suitcase could handle. Oh, how tempting it was to go buy an extra duffel bag and stuff it full with all of the goodness of Sennelier. The brushes and paints that I picked up there that day are some of the best quality art tools that I’ve brought into my studio. When I use them, I’m taken back to that rainy day in Paris. As I continue to experiment on the canvas, I try out new materials and let myself play without boundaries or rules. I recently ordered some Sennelier Oil Sticks to try out. These are essentially extremely concentrated pigments with just enough oil binder to hold them together. They’re like a grown-up version of a crayon. And, well, I am obsessed. They have the creaminess and concentration of oil paint, but move as easily across the surface of the canvas as a pencil on paper. You can blend them into the previous layers of paint, or you can soften them ever so slightly, just so that they hold their line, but aren’t harsh or too raw. I haven’t spent too much time using them yet, but from what I can tell, I am just barely scratching the surface with these. Using lines in my work is something that I’ve always wanted to incorporate, but have never found the best way. 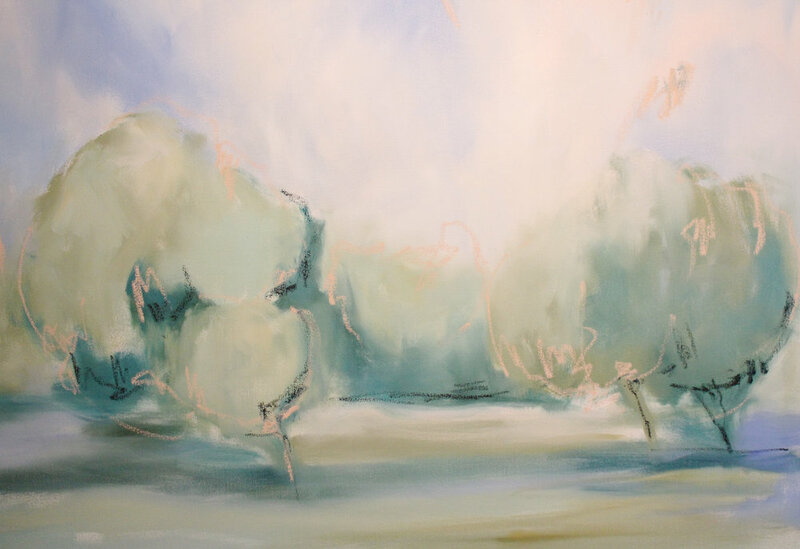 How do I maintain the soft, dreamy nature of my paintings if I use defining lines throughout my painting? I love drawing, and my style is sketchy and scribbly, and many of the motions that I use to draw are those I use with a paintbrush. I haven’t quite figured out what direction to go with the oil bars, but I know for sure that I want to keep playing and discover the way to best develop my work with these new materials. It is a gift that playing with paint is my work. I find so much joy in discovering unchartered territory, and using paint to make my way through it.